Ho-Hum…A Boring Day In #Sackvegas. Hey…Wait A Minute..(Handcuff Pic) LOL | Sack-Vegas!!!! This was taken around 4PM Today…. April 30. No idea what went down here but it sure looks interesting. Anyone have the deets? I hear there were a bunch of young people running around in the traffic…What?? I must say the grass is really starting to green up nicely on the strip. O.K. carry on…. O.K. 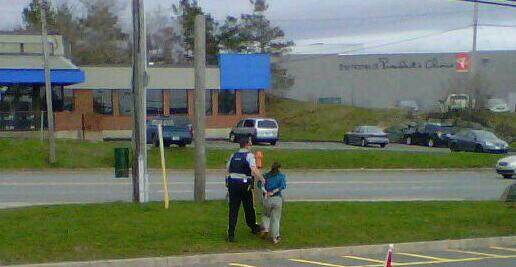 it looks like there was a shoplifting incident at Superstore Mall and then the fun began. Posted by Sacky on April 30, 2013 in Ramblings And Foolisness.